John says this blog post should consist of one word: “don’t” (He thinks it’s ludicrous that anyone would spend so little time there). But I’m going to step to the plate and share an ultra-condensed list of our most favorite experiences in this fascinating, vibrant city as well as our picks for places to eat (see the very bottom for the full list). The itinerary is insanely packed, but I think it’s possible if you get an early start and try to limit the time you spend at each site. The attractions from Day 1 are all right next to one another, so you’ll have that going for you. Cafe Privato: Fuel up for a big day with a big breakfast at this lovely place near Galata Tower that I dare say has the best Turkish breakfast in town. 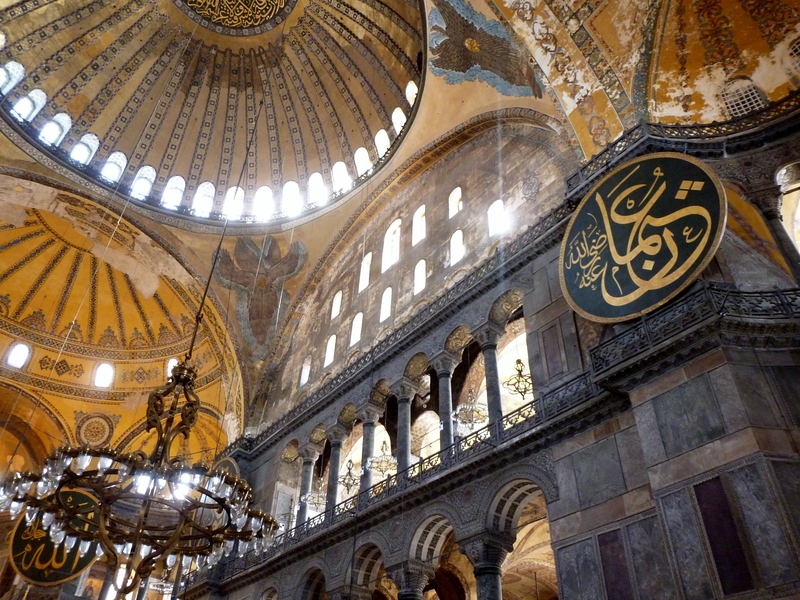 Hagia Sophia: As John told our friend Adam, “if you go to Istanbul and don’t see Hagia Sophia, we’re not friends anymore”. Hyberbole, sure, but he has a point. The stunning, gold mosaic-adorned church was the largest in the world (until Seville Cathedral was built about 1000 years later) before it became a mosque, and finally, a museum. It’s so big that the Statue of Liberty could fit inside of it, torch and all! And besides, where else will you see the Virgin Mary next to Arabic calligraphy that reads “Allah”? 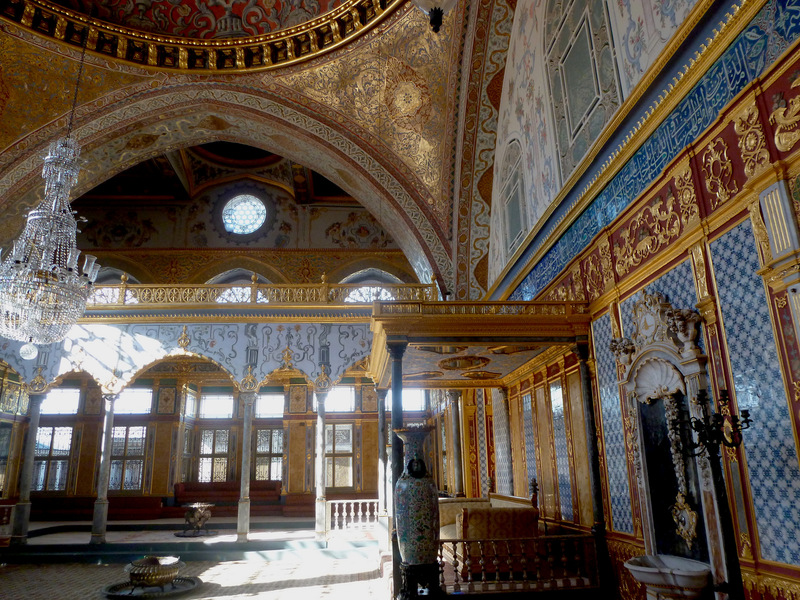 Topkapi Palace: Just behind Hagia Sofia, you can check out the harem to see how Ottoman sultans and their women actually lived, admire an impressive weapons, see a bunch of religious relics of questionable legitimacy, and gawk at loads of bling (Emeralds the size of kiwis! Everyday household items encrusted in diamonds!). 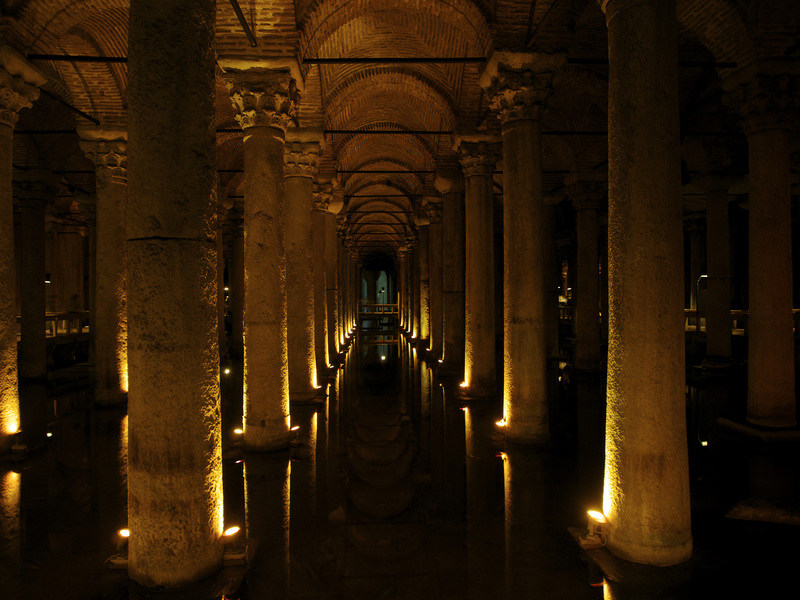 Basilica Cistern: Just beneath the heart of the Old City lies the largest of Istanbul’s several hundred ancient cisterns. The Byzantines built the underground water source using hundreds of columns, many of which were salvaged from temples, hence the occasional carved stone head lying around. 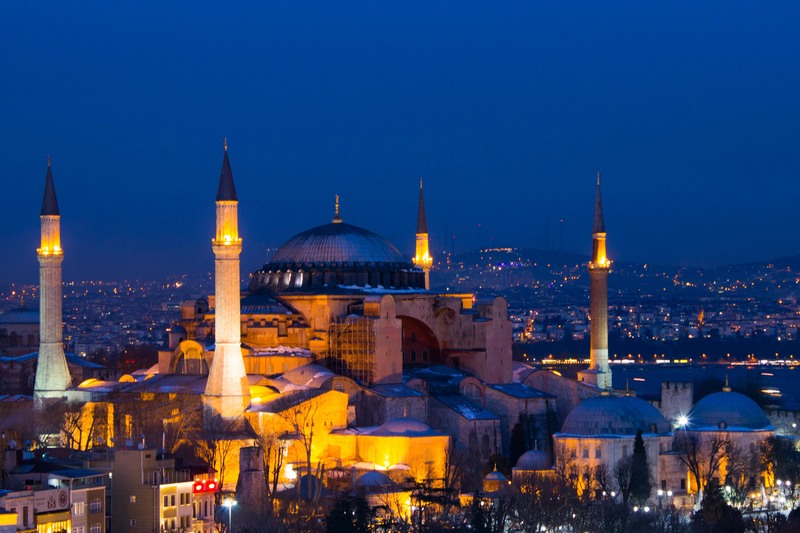 Blue Mosque: When Sultan Ahmet I came onto the scene, he sought to build a mosque to rival the grandeur of the Hagia Sophia. 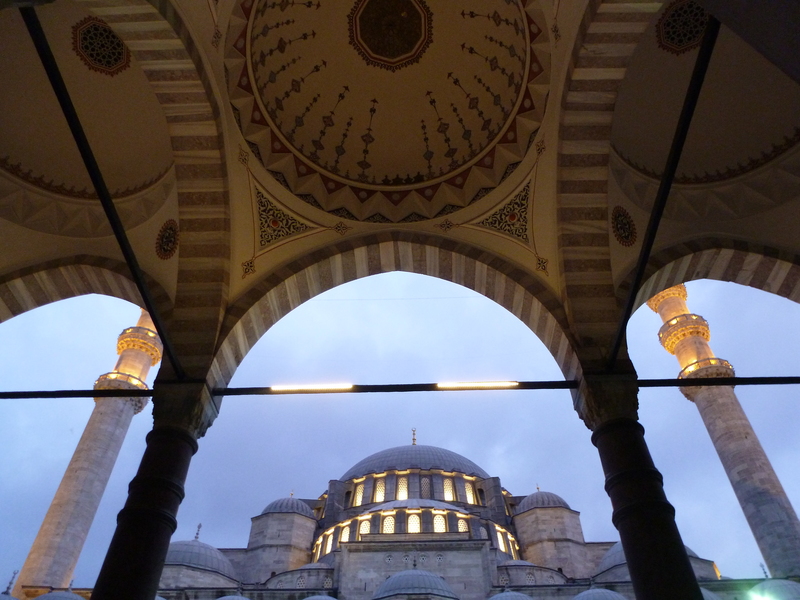 With the Blue Mosque’s soaring ceiling and intricate tiles, I have to say, he did a pretty good job. 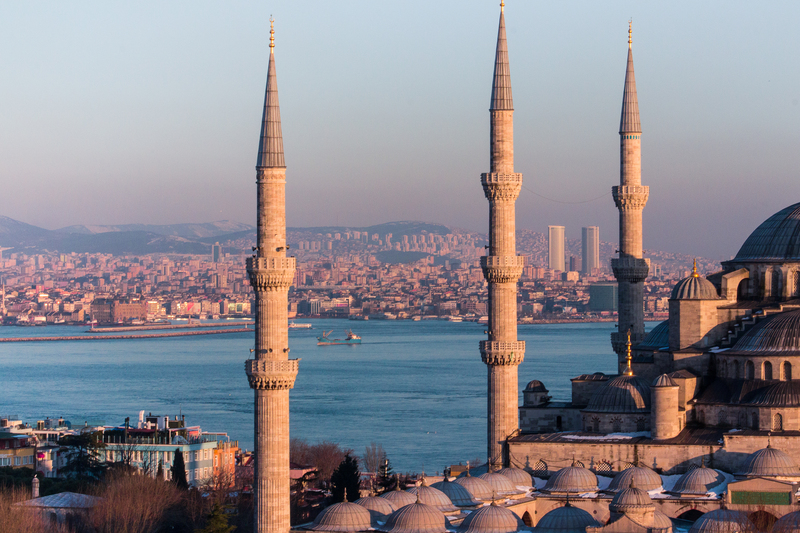 As the story goes, he ordered that the mosque have gold minarets, which was misinterpreted as “six minarets” (apparently the words sound similar in Turkish). This caused quite the scandal — only the mosque of the Ka’aba in Mecca had that many minarets; how dare he! — and led to the construction of another minaret in Mecca to restore the order of things in the Muslim world. Hippodrome: Make a point to walk through the Hippodrome, the social center of Constantinople that housed chariot races and other sporting events. The Byzantines decorated it with columns and obelisks, some of which remain today. 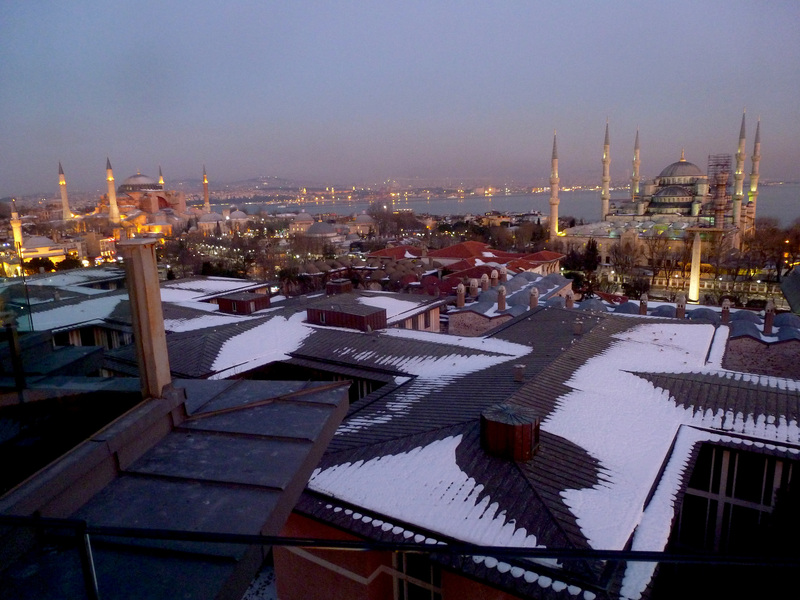 Get a panaromic view of the city — Just around the corner from all these sites is Fine Dine Istanbul, a rooftop restaurant with spectacular views of a city that seems to go on forever. 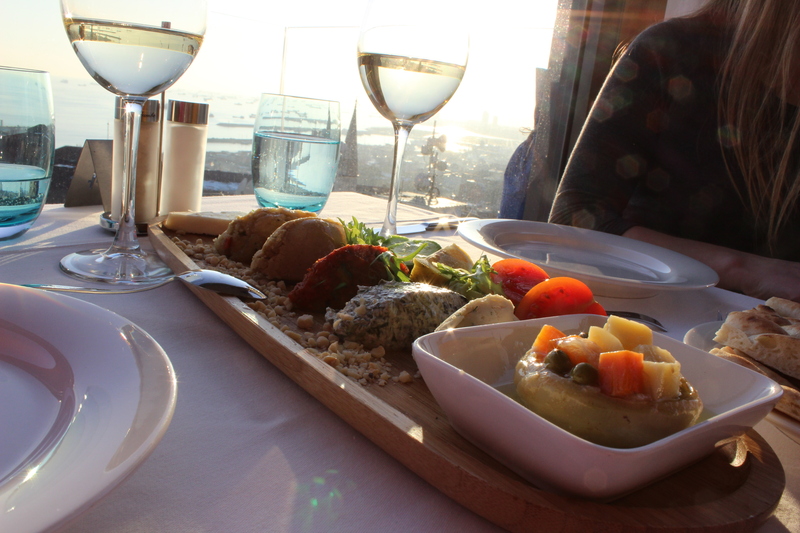 Grab some mezes or a drink while you watch the sunset. Leb-i-Derya, Mikkla, and 360 Bar are similar options in the New City. 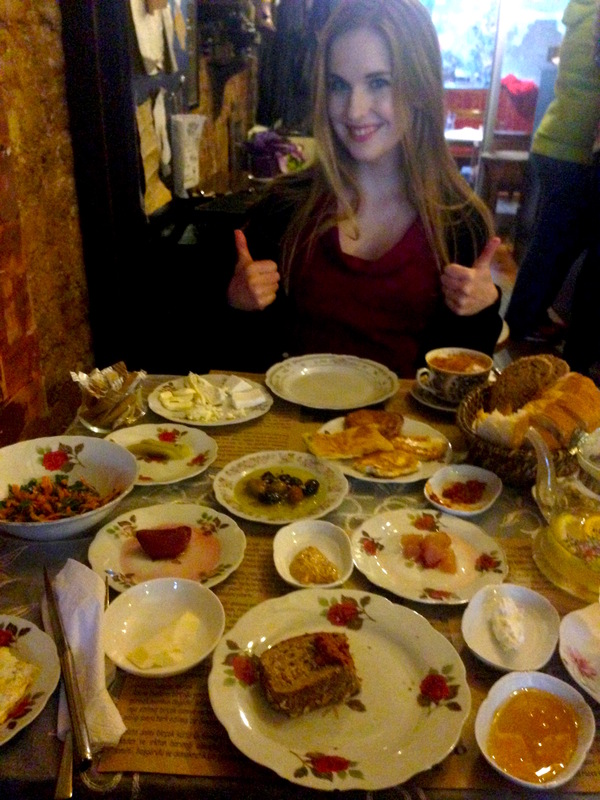 A meal rich with culture — Walk down the famous İstiklal Caddesi — Istanbul’s famous pedestrian avenue — to Ficcin for Circassian cuisine (and an improptu Circassian folk dance, if you’re lucky), or Çukur Meyhane for a traditional meyhane experience. Meyhane literally means “drinking place”, and is where the Turks go to for raki (Turkey’s beloved anise-flavored liquor), mezes, and hours of conversation. Şerefe! (“Cheers”, pronounced like “Sheriff A”). 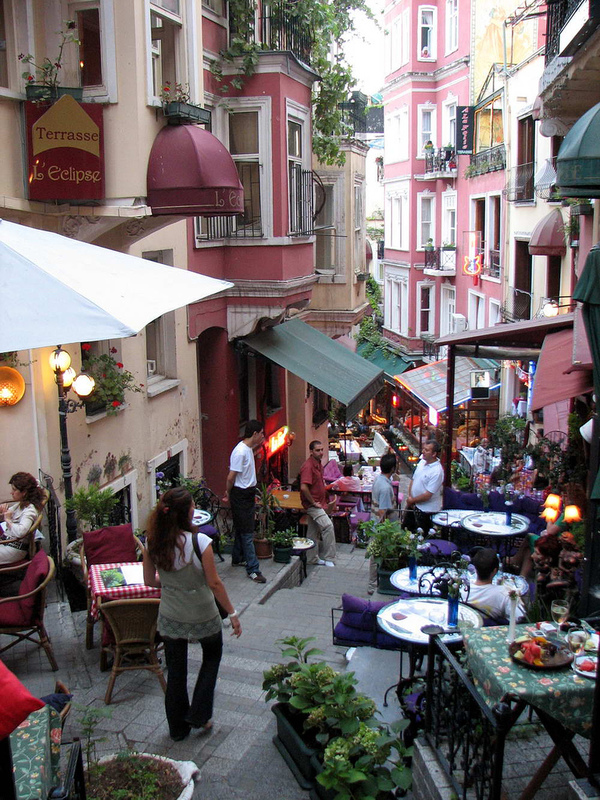 Cezayir Sokak: Head to Cezayir Sokak, a lively, somewhat hidden pedestrian side street that’s packed with terrace-lined cafés and bursting with live music. Nearby Solera Winery is another option, particularly if you’re in the mood for wine in a less hectic setting. Turkish hamam: Turks have been going to the hamam — bath houses for cleansing and relaxing — for centuries and it remains a major part of Turkish culture today. Just be sure to read up on what to expect and hamam etiquette before you go. Bonus: Hamams are a Gwyneth Paltrow-recommended hangover cure. Kurdish breakfast: Head to the popular Van Kahvalti Evi for an amazing Turkish breakfast with a Kurdish twist, and enjoy a walk through the heart of Cihangir, the lively, bohemian district we used to live in. You could also hit up Kronotrop for the best espresso in town, and grab some baklava at Savoy Pastanesi, which boasts the city’s tastiest baklava, in my opinion. 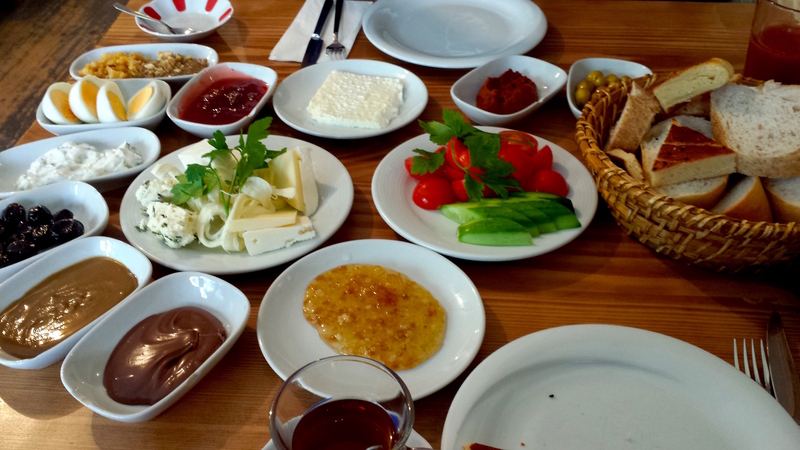 Turkish breakfast at Van Kahvalti Evi. 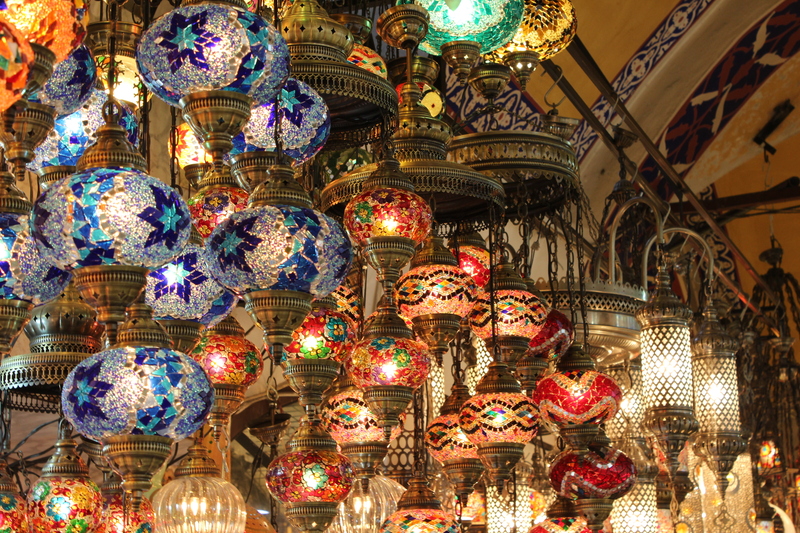 Grand Bazaar — This is one of the largest and oldest covered markets in the world, with 61 streets and over 3,000 shops. It’s a nice place to find any Turkish souvenir you can dream of as well as try and buy freshly rolled Turkish delight, although you can find cheaper (and less fresh) alternatives pretty much anywhere. 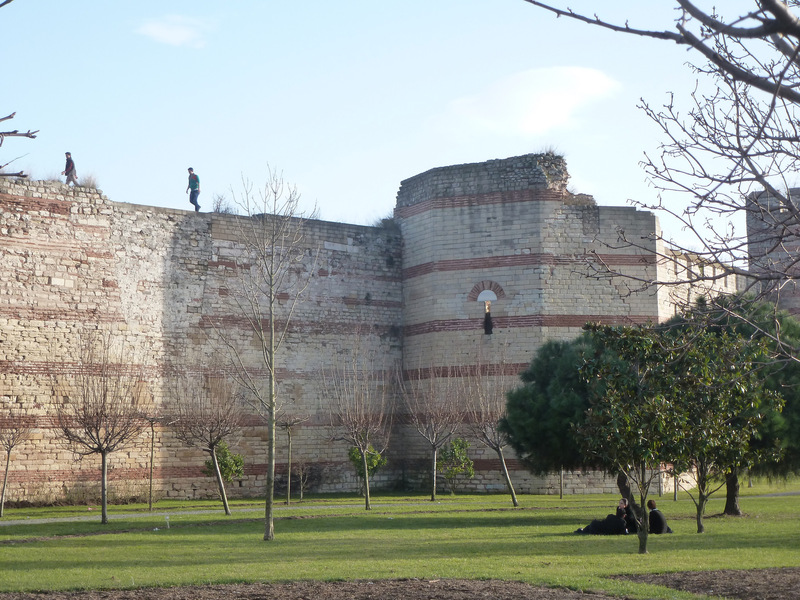 Holy Savior in Chora and the old landward walls: Check out the stone walls that surrounded and protected the city of Constantinople before making your way over to Holy Savior in Chora. 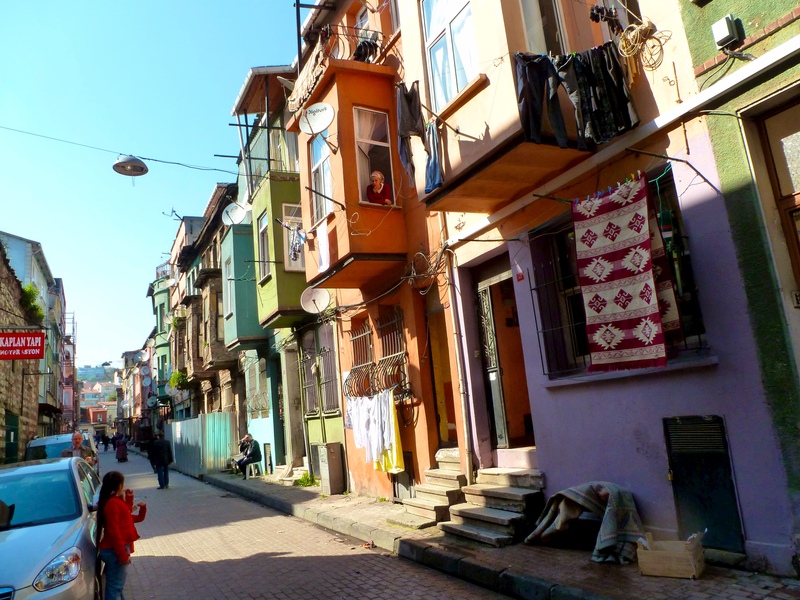 Along the way, you’ll walk through some of Istanbul’s poorest and most conservative neighborhoods and experience a totally different side of the city. 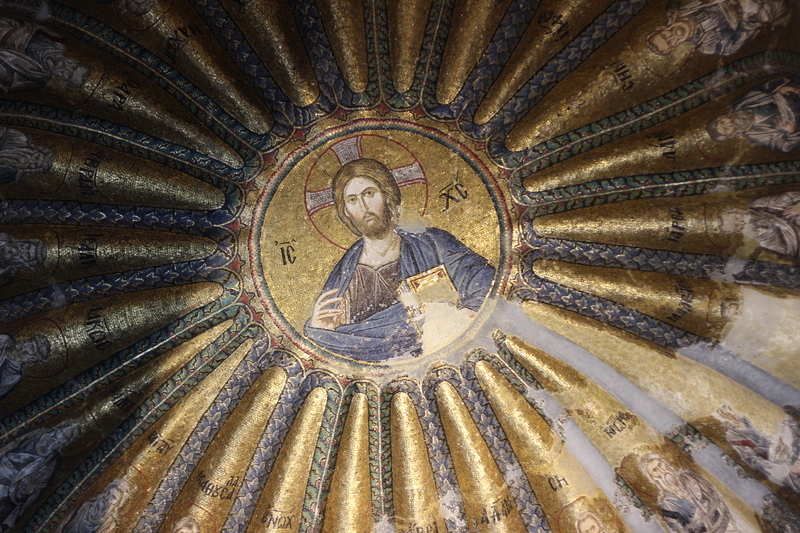 Chora is a tiny church, but completely covered with beautiful mosaics in all their glittering gold glory. If you want a quick snack, grab something next-door at Asitane, which offers Ottoman cuisine prepared using the same recipes that nourished sultans hundreds of years ago. Its hummus, a cinnamon currant variety, is among the best I’ve ever had. 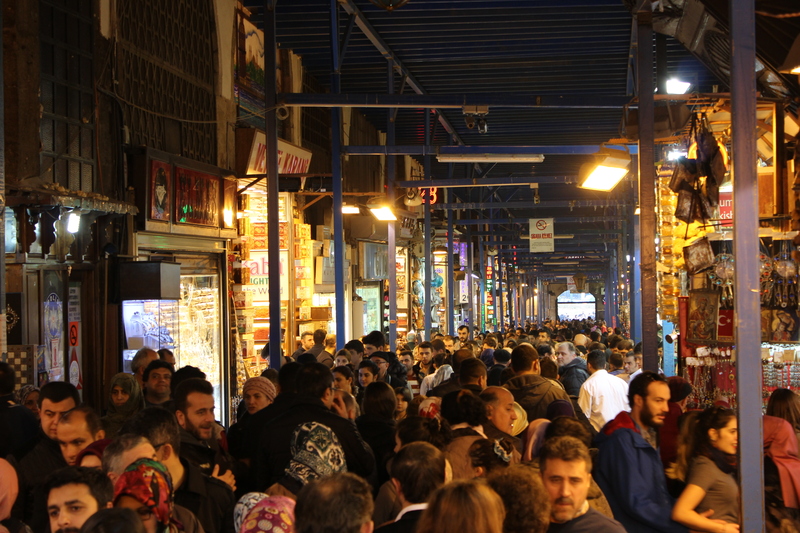 Walking İstiklal at night: This bustling, endearingly chaotic pedestrian avenue attracts around 3 million people a day, and really comes alive at night. 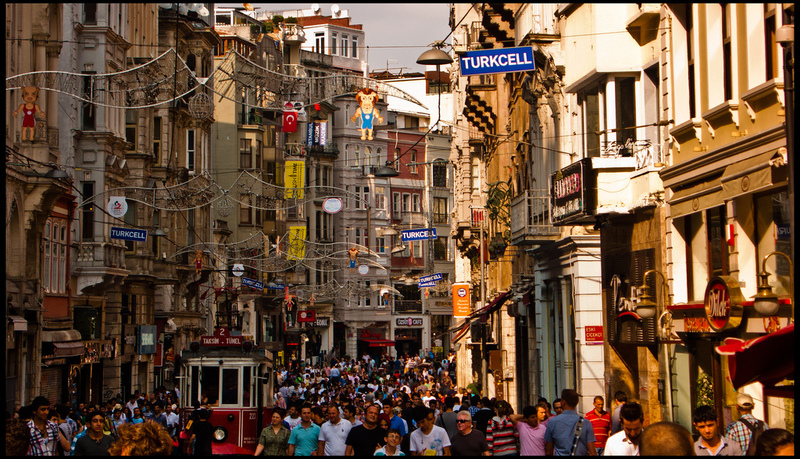 Tons of streets off the north side of İstiklal are lined with lively bars, cafes, and clubs (e.g., Asmalı Mescit, Nevizade Sok., Balo Sk. ), so I’d suggest just dropping in a place that catches your eye. A few of our favorite finds were on Gönül Sok. : a spot called Alex’s Place, which feels like a pop-up craft cocktail bar, and Rasputin, a dive bar with a punk edge to it. Egyptian Spice Market: This Ottoman-era marketplace sells spices, dried herbs, nuts, dried fruits, and trinkets. 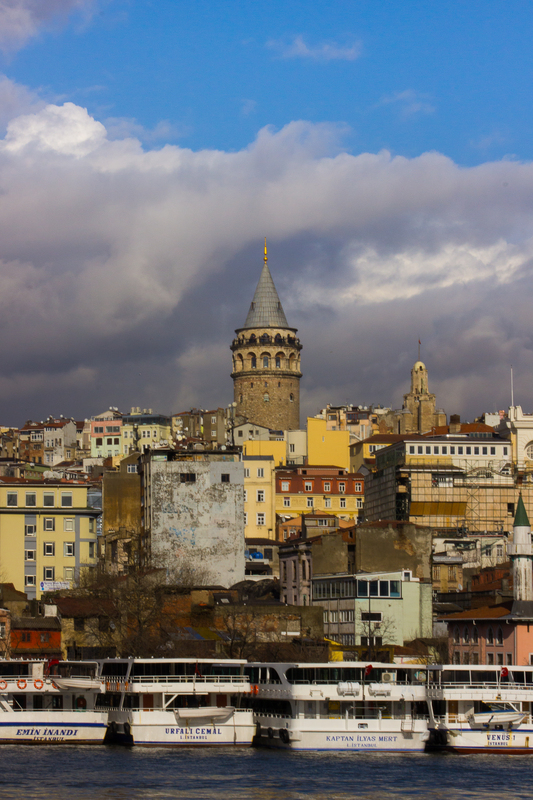 Galata Tower: This medieval stone tower dominates the New City’s skyline and offers a panoramic vista of Istanbul’s historic peninsula for those willing to pay to go to the top. Karaköy: This “it” neighborhood has a hipster vibe and tons of trendy coffee shops, restaurants, and bars. Unter is a great nightlife spot, and Karaköy Güllüoğlu has some of the best baklava in Istanbul. 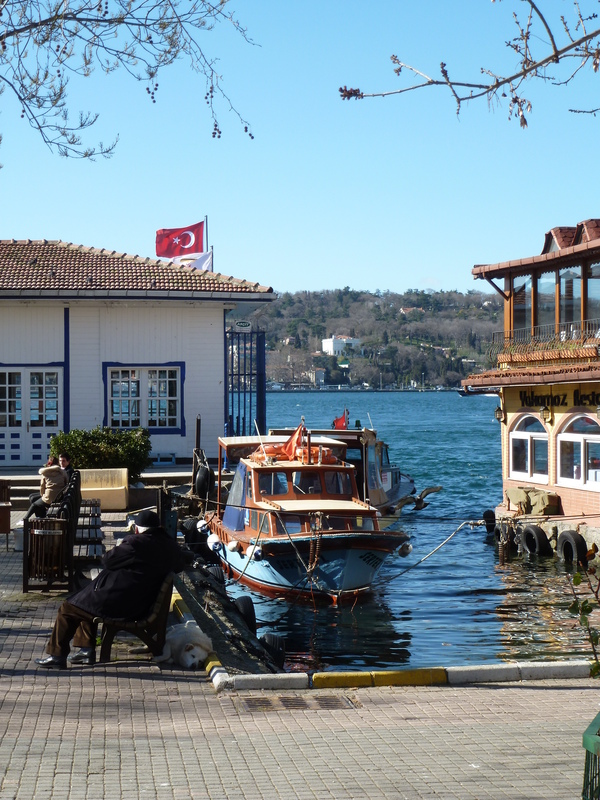 Boat to Kanlıca: This tranquil district up the Bosphorus is home to the best yogurt I’ve ever had, from a water-side cafe called İsmailağa. 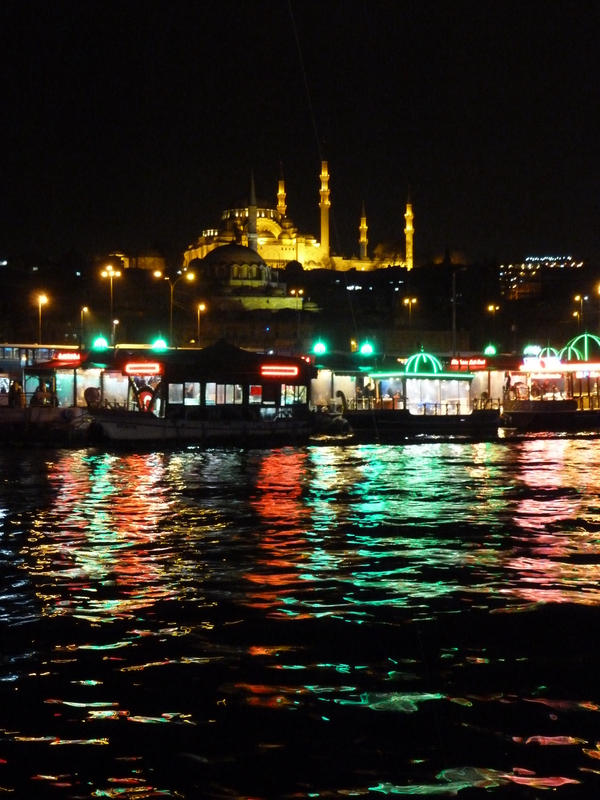 Plus, you get a bonus boat cruise Bosphorus and can say you’ve gone to Asia for the yogurt. Galata Bridge: Walk across the Golden Horn on this fishermen-lined bridge that connects the Old City with the New City. Byzantine Istanbul: Much remains from the days of Constantinople beyond what I’ve listed above (Hagia Sophia, Chora, city walls, and Hippodrome). The Great Palace Mosaic Museum is pretty cool, plus John has outlined tons of other ideas for exploring Byzantine Istanbul. Whirling dervishes: Wearing long, flowing robes and tall hats, the Whirling Dervishes twirl to live music played on ancient instruments as a form of worship said to bring them closer to god. I can personally recommend Hodjapasha Dance Theatre, but there are plenty of other places to catch a ceremony. Ortaköy: This cute neighborhood is home to a lively square, cafes, shops, and the very photogenic Ortaköy Mosque, which sits on the shores of the Bosphorus. Scene from a neighborhood near the city walls. 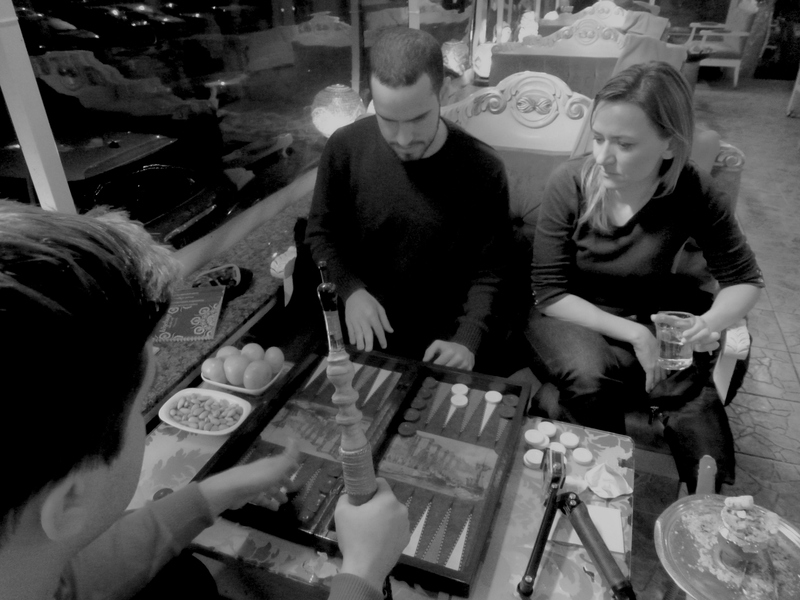 Hookah and backgammon: You’ll find these quintessential Turkish things all over the city, but there are bunch of spots in Karaköy, right by the Tophane tram stop. Most don’t serve alcohol, but La Viola and other spots on Gazeteci Erol Dernek Sok. (a block south of İstiklal) offer both. Mehter Military Band: The world’s oldest military band plays music that’s designed to instill fear in its enemies. 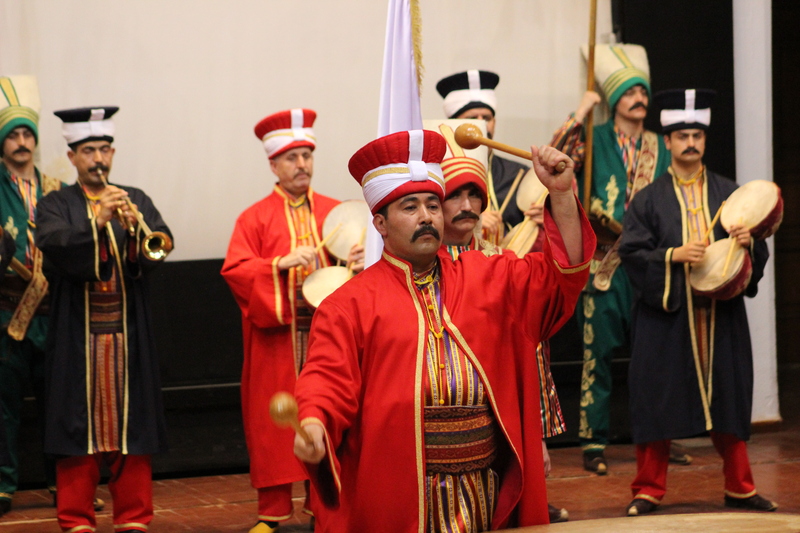 Catch a performances nearly any day at the Turkish Military Museum. Süleymanie: One of the grandest and most beautiful Ottoman mosques, it’s perched atop one of the tallest points of the Old City. 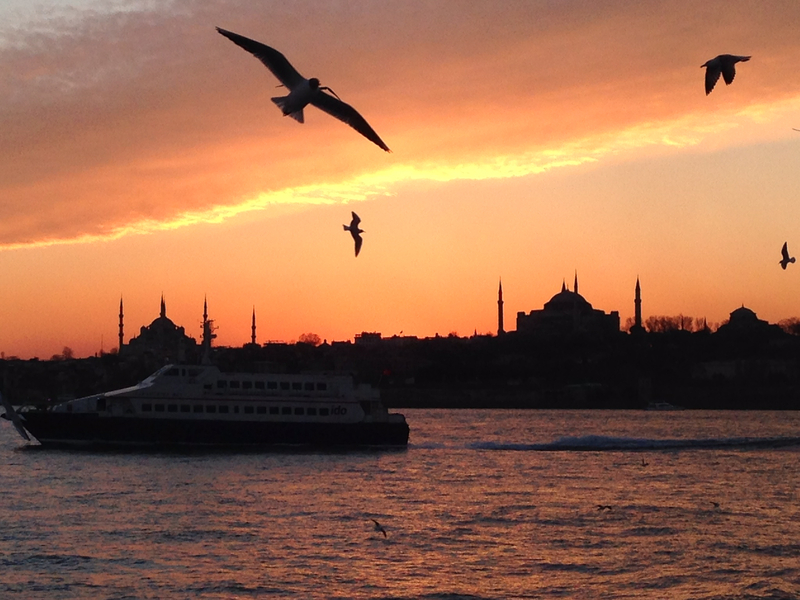 Listening to the sunset call to prayer here is one of our favorite Istanbul experiences because you can hear several of them at once, coming from minarets across the city. 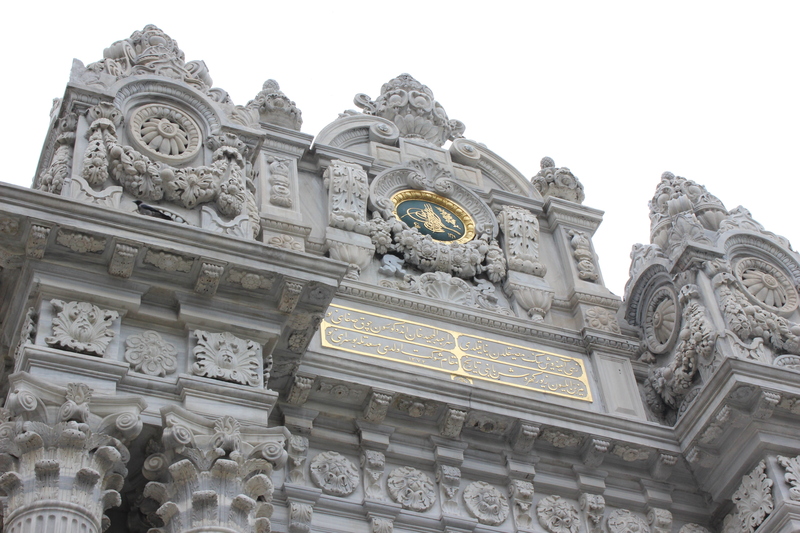 Dolmabahçe Palace: The sultan’s palace on the Bosphorus symbolizes the magnificence and decadence of the 19th century Ottoman Empire. The Pierre Loti Cafe: Named after the French novelist, it’s famous for its spectacular views over the Golden Horn. Cappadocia: Okay, this isn’t Istanbul, but if you’ve got a week, this stunning region in central Turkey is a must in my book and is very cheap to fly to from Istanbul. 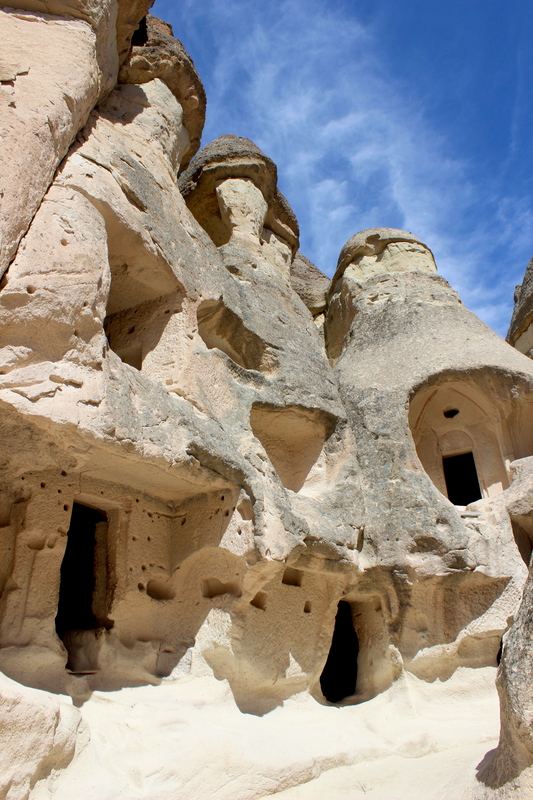 It’s known for its bizarre rock formations, moon-like landscape, cave churches, and houses carved into rocks. You can even stay in a cave hotel! New city (Galata/Istikilal): Ananas Juice Bar, Antiochia Concept, Cafe Privato, Community Kitchen (vegan), Ficcin, Helvetia, Hayvore, Leb-i-Derya, Mezze by Lemon Tree (fine dining), Miss Pizza, Pizza Vegas (pizza by the slice), Varka Antakya Lezzetleri, Yeni Lokanta (fine dining). Look for a spot in the New City near İstiklal and/or Galata Tower. It’s conducive for sightseeing and getting around, especially when you’re close to the Tünel funicular by Galata Tower. 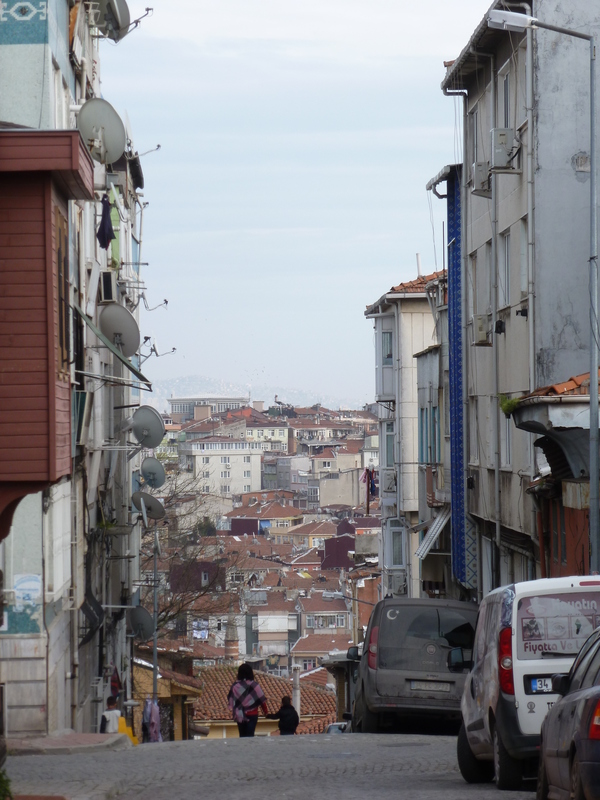 Balat neighborhood, not too far from the land walls. 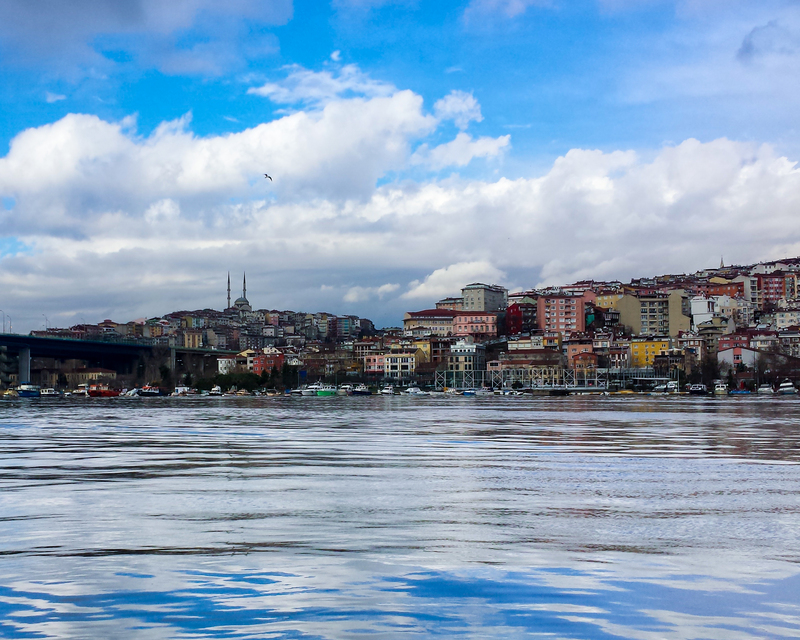 View across the Golden Horn. 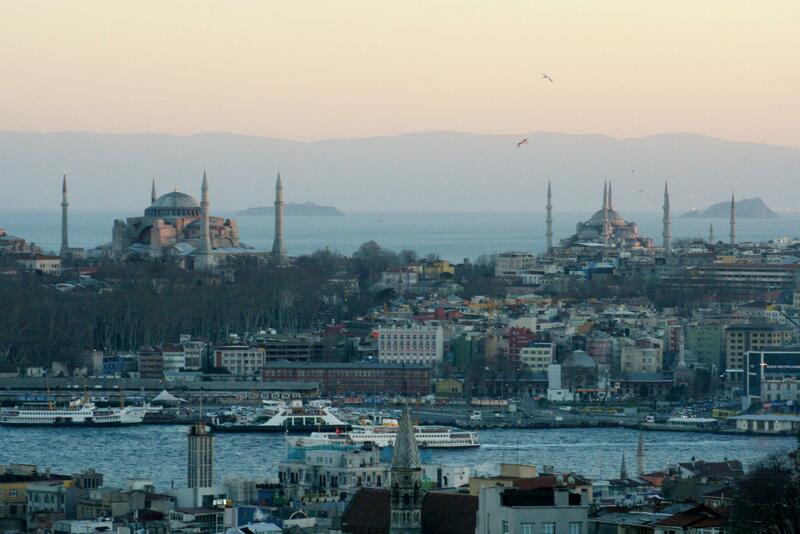 View of the Old City, the Golden Horn, and the Sea of Marmara from 360 Bar, in the New City. John makes an excellent point. I wonder how much Turkish coffee one would need to squeeze in every possible waking moment?! SO much Turkish coffee. Interestingly, even though Turkey’s known for their coffee, tea is by far the most popular hot drink there. They drink an average of 10 cups a day — the highest per-capita consumption rate in the world! So the itinerary should probably be contingent on attaining Turkish levels of caffeine consumption … good point. 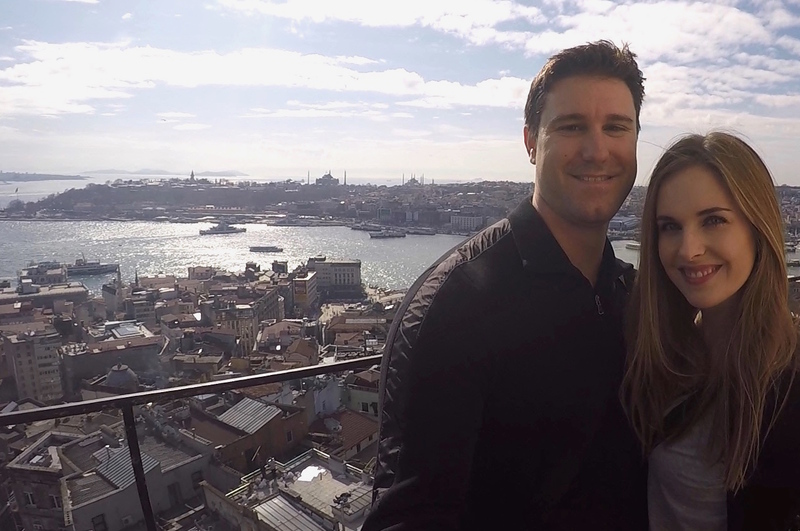 Wonderful recap of Istanbul! Thanks for sending.